We’ve seen just about everything branded with Star Wars at one time or another. From a Chewbacca backpack to a Darth Vader toaster to a tauntaun sleeping bag, people have been cashing in on the franchise since it began. And don’t even get us started on the fan art, most of which is hilariously dreadful. 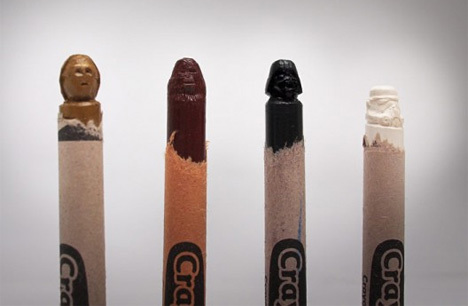 But these Star Wars crayon sculptures from Steve Thompson are actually really, really cool. 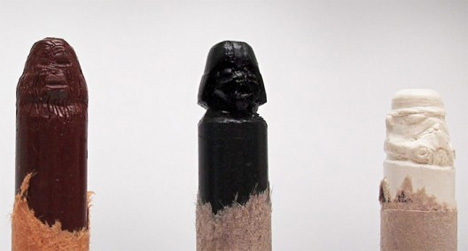 Steve must be a big Star Wars fan because these itty-bitty sculptures are perfectly and intricately carved. The Storm Trooper is our fave. But like any good geeks, we have to ask: where are the Ewoks? See more in Science Fiction or under Science. November, 2011.